Baby Face Doll 411 » Blog Archive » Look who is on eBay this week! « Today is Open House Day! We have not seen Sally for a while, so it is no wonder that there are already 15 bids on this auction and the price is already over $200. 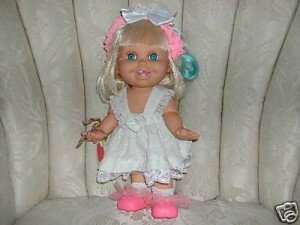 She is loose, looks to be lightly played with and has her complete original outfit and has her heart charm tied on her wrist. Here is the auction link. Good luck to the bidders.